Close enough to be a daytrip and fun enough to be a full weekend, Bear Mountain is a great convenient option for NYC families! We decided last minute to go up and spend one night there. We booked a room in one of the Stone Cottages at the Bear Mountain Inn. Bear Mountain Inn has an incredible history dating back to 1915 (it was built in the classic Adirondack style that screams The Harrises!). The Inn itself has 15 rooms, and additionally there is the Overlook Lodge and the Stone Cottages. We did not have a chance to check out the Overlook Lodge, but rather, we stayed in one of the four Stone Cottages. Each cottage has 6 guest rooms that share a common space. The rooms themselves were very simple, but the common space has a nice big stone fireplace. We sat around in the evening sipping wine and letting Sally play with Legos. Two other women staying there came out and shared their wine with me, and they were really sweet with Sally. The communal vibe ended up being an added bonus. All in all, it's a nice experience, but not sure if it's worth the price for us to stay overnight again. We are definitely happy we stayed and will for sure be going back for daytrips! The Inn, Overlook Lodge, and the Cottages are situated around Hessian Lake where there is a nice paved path to walk around the lake. It was easy enough to take the stroller around the 1.5 mile loop that had with beautiful views and somewhat hiking vibes. We did not venture off on more challenging hikes, but there are plenty to choose from! You guys! The Trailside Museums & Zoo is THE BEST! I couldn't even with this place. It's an easy walk from the Bear Mountain Inn where you take a LOVELY stroll through the woods (all stroller friendly) to 4 different museums as well as visiting woodland animals along the way. Wes Anderson himself would have had a difficult time designing a more charming space and exhibits. These museums are in small granite buildings that were built in the 1920s: The Herpetology Museum, Nature Study Museum, Geology Museum, and the History Museum. 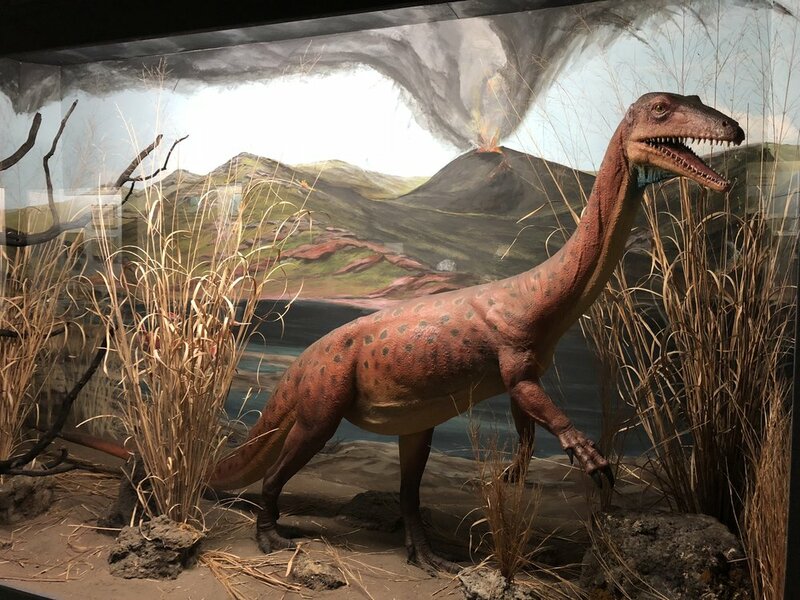 They all have old-timey dioramas and loads of information about local geological formations, lives of native settlers, and an endless number of taxidermy (and some live snakes too!). As you wind your way through the woods to reach these museums, you come across the zoo. This is not your average zoo, so don't go looking for giraffes. We saw foxes, owls, hawks, and bears. There were also plenty more animals we didn't see whose cages indicated they were hibernating for the winter. I was happy to read that these animals were only in captivity because they are unable to live successfully in the wild, either because they were injured or born in captivity. While Sally enjoyed the experience, I think she will love it more and more the older she gets. Also, it was quite freezing that day and Alan was sick, so we moved through all of this rather quickly. I can't wait to go back again and again over the years and let Sally discover more with each visit! PS: On the walk over to the museums we passed an insanely huge and beautiful pool! Given that it was December, it was drained and empty, but it was built into the rocks with trees all around it. I cannot wait to head back in the summer and go for a swim! (although I'm guessing it will be super crowded then).